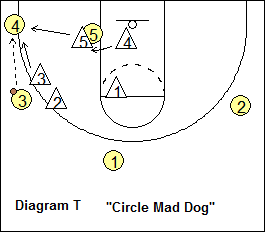 This article discusses coach Dave Robbins' DVD and his "Circle" defense. Coach Robbins has built a strong Division II program at Virginia Union University. 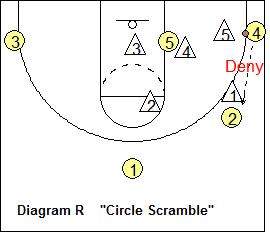 This is an aggressive 2-3 zone defense ("Circle"), which can also be run as a 1-2-2 zone defense ("Guard"). There are trapping options ("Scramble" and "Mad Dog"). Coach Robbins also describes how he can go from zone to various man-to-man defenses ("10", "11", and "12") in the same possession in order to confuse the defense. He also discusses "Circle & 1" which is like a box & 1 with one defender playing the opponent's star player man-to-man, while the other four defenders are in the circle zone defense. Get the DVD! If you are serious about using this defense, you must get Coach Dave Robbins' excellent DVD. The DVD features on-court 5-on-5 demonstrations with Coach Dave Robbins teaching the Circle zone defense, including all the defensive rotations and important details and special situations. Be aggressive and get tight pressure on the ball. "Jam" the offensive player with the ball. The two low outside defenders (X4 and X3) guard the first pass to the wing and stop the wing jump-shot. The two top guard defenders must keep the ball out of the middle, including keeping the ball out of the high post at the free-throw line. The only time (in "Circle") that the top guard defenders have wing responsibility is when the pass is made from the corner to the wing. Point to wing pass. 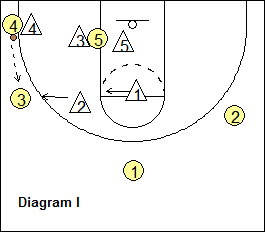 The defense starts with a 2-3 zone look (diagram A). 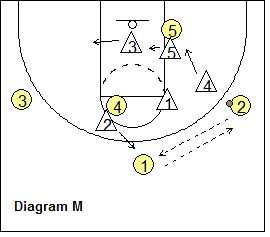 The guards X1 and X2 keep the ball out of the middle and out of the high post. 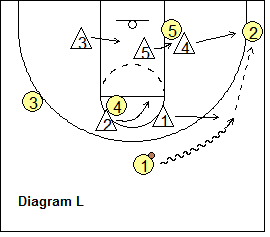 On the first pass to the wing (diagram B), the outside low defender X4 closes-out and jams the ball on the wing. 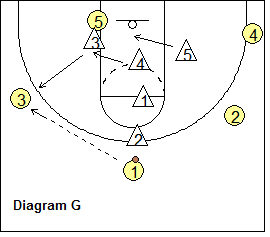 X5 rotates around and fronts the low post player, as the opposite low defender X3 rotates into the paint, behind the low post player O5 (diagram C). X1 drops to the elbow to keep the ball out of the high-post. Wing to corner pass. 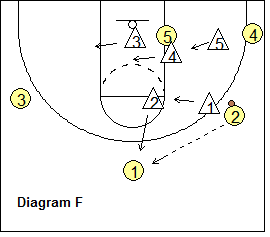 If the ball is passed from the wing to the corner (diagram D), the defender fronting the low post (X5) sprints out and takes the ball in the corner, as X4 quickly x-cuts and sprints down to front the low post, while X3 is still behind the low post. X2 drops to the ballside elbow to keep the ball out of the high post. 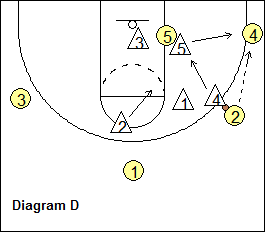 Corner to wing pass. 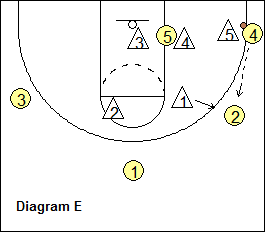 The ballside guard defender X1 will take the pass from the corner back to the wing (diagram E). Note that this is only time in "Circle" where the guard has wing responsibility. Wing to point pass. If the ball is passed from the wing back to the top (diagram F), the opposite guard defender X2 will take the ball as X1 sprints in to deny the high post, and the three low defenders rotate back to their "neutral" positions. Reversal. Now notice that the ball is being passed to the left wing (diagram G). Here the ballside low defender X3 sprints out and jams the ball. 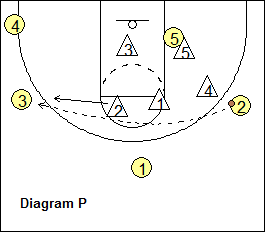 X4 fronts the low post and X5 slides behind the low post player O5. 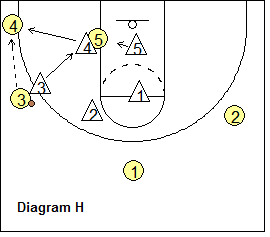 On the pass from the wing to the corner (diagram H), the low post defender X4 sprints out and jams the ball, while X3 sprints back down to front the low post. If the ball is passed from the corner back to the wing (diagram I), the ballside guard again covers this pass and jams the ball. The rotations follow all the same rules on ball-reversal. Ball in the Low Post. Although we try to prevent it from getting there, there will probably be times when the ball does get into the low post (often when defenders are late in their rotations). 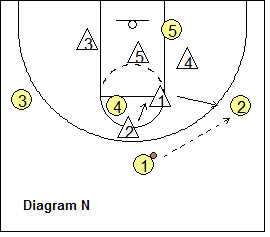 Diagram J shows the ball passed into the low post. 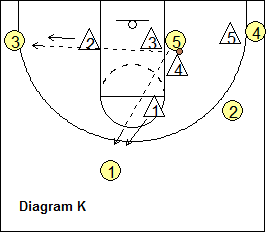 Here, we have X3 between the offensive player O5 and the basket, and X4 sprints down from the wing and double-teams the low post (diagram K). 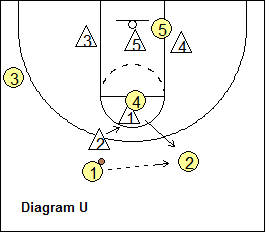 From the double-team, O5 will usually just look to pass out of the double-team. X1 takes the pass out to the top, or to the ballside wing. Notice that the opposite guard defender X2 must get "as low as the lowest" weakside offensive player. O3 has moved down to the weakside corner, so X2 drops down low as well. 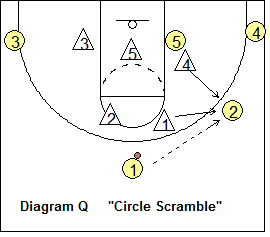 If the pass goes from O5 to O3, X2 sprints out to guard the ball. Dribble to the wing. Diagram L shows the rotation when the ball is dribbled from the top to the wing. In this case, X1 just goes with the ball and X4 stays inside, as X2 moves to the ballside elbow to prevent the pass to the high post. 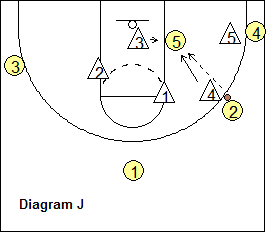 If the ball is passed then to the corner, the post defender X4 sprints out and jams the ball, as X5 rotates around and fronts the low post and X3 slides behind O5. Following our normal rules, if the ball is passed from the corner to the wing, X1 would cover the wing. Quick passing from wing to point and back to wing. Diagram M shows the coverage after the first pass from point to wing with X4 up on the ball. O2 passes from the wing back to the point and X4 moves back inside, as X2 takes the ball. Now, if O1 passes quickly back to the wing O2 (diagram N), it is often easier in this case for X1 to take the ball, rather than X4 sprint back out. Players must communicate. Defending skip passes. The general rules in defending skip passes are similar to any defense. If the ball is skip-passed to the opposite corner (or below the free-throw line) as seen in diagram O, the opposite (weakside) low defender should sprint out to the ball. If the pass goes to the opposite wing or above the free-throw line extended (diagram P), the opposite (weakside) guard should take the ball. If the skip-pass goes from the corner to opposite wing (diagram O2), the weakside guard defender takes the ball. You can just call it "scramble" as we already know we are in "Circle". Here, we allow our strongside guard defender to gamble (trap and deny), while the other four players follow our usual Circle rules. Diagram Q shows the pass from the point to the wing. X4 comes up as usual to defend, but here, X1 scrambles and sprints over and traps the wing with X4. Diagram R shows another tactic that our strongside scrambler can use. When the ball is in the corner, X1 can deny the pass back to the wing. Or, X1 might "hide in the weeds" and look to intercept either the corner-to-wing pass, or the wing-to-point pass. If the ball is reversed to the left side, X2 would have similar options of trapping, denying, and intercepting on that side of the floor. You can just call it "Mad" as we already know we are in "Circle". 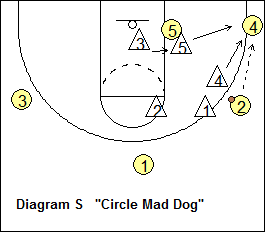 With Mad Dog, everyone has the option of trapping, denying, and intercepting except the weakside low defender, who must protect the basket. Diagram S shows the pass from the wing to the corner. X5 sprints out as usual, but instead of dropping inside, X4 also sprints to the corner and traps with X5. 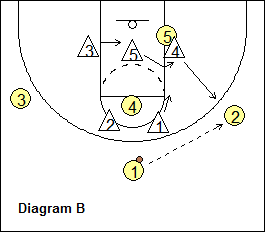 X3 protects the basket inside, and X1 would deny the pass back to the wing. This could also happen on the left side of the floor (diagram T) and here the weakside low defender protecting the basket is X4. Running Circle against a two-guard front with a high post is the same as above, but our two guard defenders must work really hard and pay close attention to keeping the ball out of the high post. Diagrams U and V show how this is done. 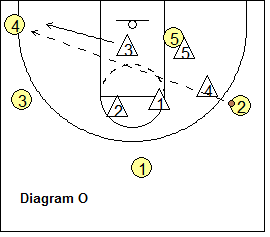 When O1 has the ball (diagram U), X2 takes the ball and X1 denies the pass to the high post, leaving O2 open. 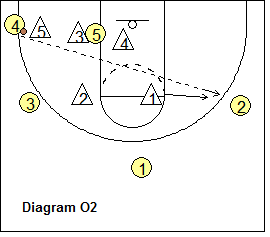 When the ball is passed to O2, X1 goes to the ball and X2 quickly drops back to deny the high post, leaving O1 open. 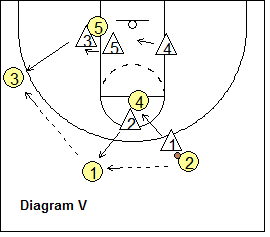 If the ball is passed back to O1 (diagram V), X2 once again takes the ball and X1 drops to deny the high post. Also notice in diagram V, that if the ball is passed to the wing O3, X3 sprints out to the ball, as we are following all of our normal Circle rules. 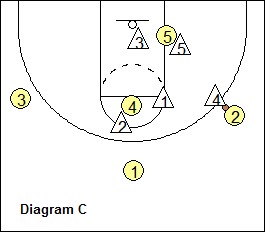 Mixing in Man-to-Man Defenses - "10", "11", and "12"